Abraham Lincoln was the sixteenth President of the United States who played an instrumental role in the liberation of slaves in the United States of America. He was born to poverty in a small log cabin in Hodgenville, Kentucky, and he soon began studying to be a lawyer by himself. He continued to progress further in politics until he became the country's president for the Republican Party. During the American Civil War in which several states seceded to become the Confederacy, largely due to them wanting to keep and preserve slavery, he opposed them as the leader of the United States. During the course of the war, he issued the Emancipation Proclamation on January 1, 1863, declaring the freedom and liberty of all slaves in the Confederacy. However, in Mario's Time Machine, Abraham's Spectacles are stolen by a time-traveling Bowser in the White House in Washington, D.C., preventing him from issuing the proclamation; Mario later travels back in time himself to return his Spectacles. 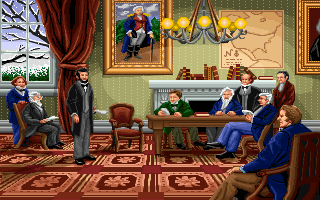 According to Mario's Time Machine, Abraham Lincoln is celebrated as the "best speechwriter and speaker in American history" and he is considered by many to be "the greatest American President". In 1863, after Bowser steals his Spectacles, Mario travels to the White House to return them without knowing that they belonged to him. If Mario talks to Abraham regardless, he introduces himself and asks if he is the president. Abraham says yes, but he also asks Mario how he managed to enter his office without the permission of the guards. He also says that he does not mind talking to him, but he needs to address his Cabinet, and he asks Mario to knock next time. Mario then talks to various other people within the White House, including Abraham's wife, Mary Todd Lincoln, about the history and life experiences of Abraham Lincoln. After fully understanding that the Spectacles belong to Abraham, he returns to his office (again without knocking) and presents them to the president. He jokes that he cannot see what Mario is holding without his glasses before taking them and thanking Mario. As he prepares to read out his Emancipation Proclamation, Mario asks him what his favorite speech is, and he responds that his favorite words are from America's Declaration of Independence penned by Thomas Jefferson, especially for the meaning behind them: "All men are created equal". This page was last edited on February 11, 2019, at 03:43.